“On Tuesday, the brothers met youth in a township called Vosloorus. They were nicely welcomed by the parish priest, Fr Duncan Tsoke. The youth were ready and they had a very good discussion and sharing. Prayer in the parish church was very lovely. 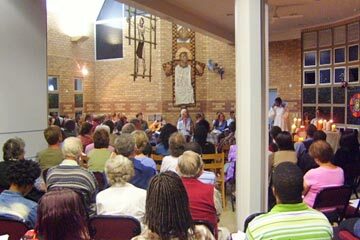 We then went to Rosebank Catholic Church in Johannesburg. There about 120 people gathered, many people in their 30’s. They are searching for spirituality. There was a long sharing after tea in the hall. Yesterday, the brothers went to the Methodist Church in central Johannesburg. They met many Zimbabwean refugees and had midday prayer there. In the evening they traveled to Pretoria and were met by Rev Willem Nicol of the Dutch Reform Church. 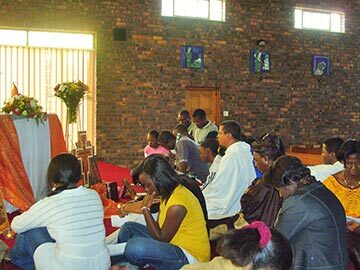 The prayer was held at the University of Pretoria Church. There were 350 people, a good number of students included. When a pastor at Midrand was asked how he saw the future of South Africa, he replied: If I have to use a Biblical image to describe the present situation, I would say that South Africa has come out of captivity, and we are crossing the desert towards the promised land. Clearly there are difficulties of many kinds, but the people continue on their way to the promised land. On 22 November, the brothers were taken to Cape Agulhas, the southernmost point of Africa, where the Indian and Atlantic Oceans meet, to pray for all the 54 countries of Africa, one by one, from Angola to Zimbawe.